With the help of University of Florida mechanical engineering professor and UF postdoctoral researcher Brandon Krick, Florida State University paleobiologist Gregory Erickson determined the teeth of hadrosaurs — n herbivore from the late Cretaceous period — had six tissues in their teeth instead of two. “When something has been in the ground 65 million years, by and large they pick it up and look at it and say what has been preserved.’ But they don’t mechanically interrogate fossils to see if there is other information. “When they started to mechanically interrogate these teeth, what we found was all of these properties were preserved, and one other thing: these teeth were a lot more complicated than we thought. For years, Erickson, who has a background in biomechanical engineering and studies bone biomechanics as a paleobiologist, had thought so. So he turned to the UF Tribology Laboratory, which researches the science of friction and surface wear. Engineers don’t often see the interesting paleontological questions. One look at the surface of the dinosaur teeth piqued his interest, however, because he is intrigued by how wear occurs across surfaces with different materials. The shape of the tooth made him think it was much more complex than previously thought. From an engineering perspective, Sawyer his lab often works with composites that contain different material properties that wear differently, so the question was whether just two materials — enamel and dentine — would wear the way the hadrosaur teeth did. Sawyer and Krick thought not, and turned to nanoindenters and microtribometers. Just a decade ago, a paleontologist might not have asked engineers for help, and they could not have helped him. In the last 10 years, however, Sawyer said advances in engineering — tribology and nanoscience, in particular — make it possible to test more materials, even those millions of years old. Reptilian dinosaurs have been dismissed as simplistic creatures in their feeding and dental structure. They were herbivores, their teeth composed of enamel and dentine. The fossil record did little to contradict that. Testing with nanoindenters and microtribometers, however, proved the conventional wisdom wrong. “Hadrosaurs’ teeth were incredibly complicated, among the most complex of any animal. “These dinosaurs had developed a lot of tricks. The duck-billed hadrosaur was a toothy creature with up to 1,400 teeth. The teeth migrated across the chewing surface, with sharp, enamel-edged front teeth moving sideways to become grinding teeth as the teeth matured. The teeth wore down at the rate of 1 millimeter per day, cycling through the jaw like a conveyor belt, before falling out or being swallowed. 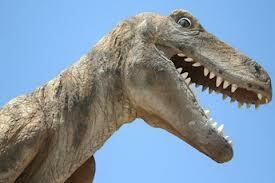 The dinosaurs lost about 1,800 teeth a year, leaving behind plenty of fossils for testing. When the fossils emerged from batteries of tests, the researchers found six tissues in the tooth structure, not two.